Rebuilding Place in the Urban Space: Could "fast freight rail" service be a way to make High Speed Rail more viable? Could "fast freight rail" service be a way to make High Speed Rail more viable? High Speed Rail is uniformly discussed in terms of passenger service, and is usually promoted for operation in high density corridors between major cities, pairs such as New York-Boston, or San Diego-Los Angeles-San Francisco, or Dallas-Houston. 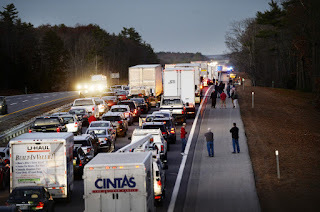 It happens that the freeways connecting these cities typically are engorged with delivery truck traffic too. Passenger rail service in the modern era isn't hugely profitable, at least in the US, while freight delivery remains reasonably profitable. Plus, demand ("More surcharges, rejected freight sting US truck firms," Journal of Commerce) is making it hard to find drivers ("'What Does a Trucker Look Like?' It's Changing, Amid a Big Shortage," New York Times)) and simultaneously, demand for long distance truck delivery services is increasing, in part because of the rise of online commerce. Why not consider trying to shift some freight service to a high speed rail network? Which would also help to reduce truck traffic on major interstates, reduce GHG emissions, etc. It would also make HSR more economically viable. FS Group freight subsidiary Mercitalia is to launch its first high speed freight service on November 7. FS says the Mercitalia Fast service is designed to meet the needs of express courier companies, logistics operators, producers and distributors. 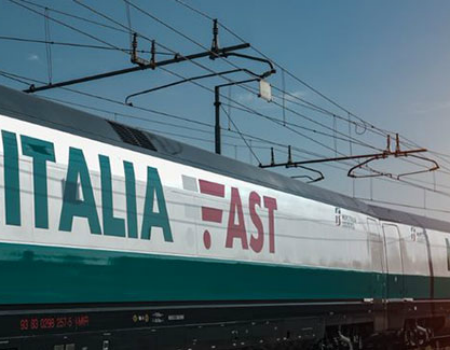 Operated by a converted ETR500 trainset, the Mercitalia Fast overnight service will convey express parcels and premium freight between the Maddaloni-Marcianise terminal near Caserta and Bologna Interporto, using the country’s north-south high speed line. 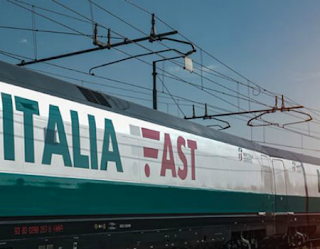 According to Mercitalia Logistics General Manager Marco Gosso, Mercitalia Fast will be the first express freight service to use the Alta Velocità/Alta Capacità high speed network. With the train running at an average speed of 180 km/h, the end-to-end journey time will be just 3 h 30 min. The trainset has been adapted to carry 1 m3 roll cages with a 220 kg payload, which will make loading and unloading ‘quick, efficient and safe’. With the 12-car train able to carry the equivalent of 18 articulated lorries or two Boeing 747 freighters, the daily train is expected to relieve the main north-south A1 motorway of around 9 000 lorries a year, reducing CO2 emissions by 80% compared to road haulage. If it works, they intend to expand the service to other nodes in Italy's high speed rail network. In Dresden, Volkswagen uses the local light rail system to move vehicles and parts between plants, with a special trainset called the "CarGoTram." That example has spurred more local transit agencies to look at their light rail systems for other opportunities in freight logistics and delivery ("Light rail network used for freight transport," Rail Freight). Granted, this is more of what I call intra-district transit rather than long distance freight transportation, but it's still an example of rethinking passenger transit systems as being solely focused on passenger service. Back in the day, sttreetcar systems and interurban--a mode that mixed shorter distance streetcar transit over long distances today the South Shore Line in Indiana and Illinois with service to Chicago is the only remaining functioning interurban in the US--would be used for overnight freight service. No, this would not make HSR more viable. If HSR were already in place, it might be an interesting marginal line of business. But no, it will not make up for a lack of a primary market. Yes, you're right. It's not enough to make it over the initial hurdle. But it could be developed into a line of business. Of course, in many European countries they already have the HSR network, so improving utilization is a marginal improvement, they don't have to create it.